What do you Glory in? We all find something that we are excited about and that we feel is important to us. In James, he talks about money this way. Read what he says in James 1:9-11. It sort of seems backwards that the person who has nothing should consider themselves higher than the person who has lots of riches. However, that’s exactly what James says. The rich person must understand that everything he has will fall way. Nothing will remain eternally except he himself. What are we gaining and how do we define success? We must recognize that the stuff that we have worked so hard to accumulate really means nothing in the grand scheme of things. Our focus must be on the eternal, not the temporary. 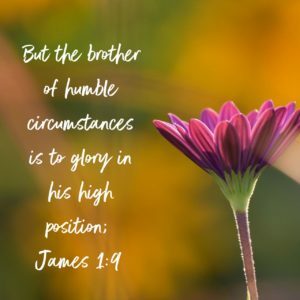 Do we glory in the high position that God allows us to have it to as his children? And if God has blessed us with an abundance of the temporary things in this life, do we use those things as tools to further bring about his glory?